[begin quote]I would say you are correct on the intent of the states to stay inn [sic] the Union. That action would be if the Federal government treated the states fairly and equal which it did not. This is proven by the Immediate Causes docs. It is also true that the South wasn’t the only secession attempt, yet no law had never been passed to address that issue. There is no citation to accompany this. In fact, Burke Davis and Shelby Foote are the only two sources I’ve seen that actually claim this occurred. I have yet to find any primary source that corroborates this claim. This is from a section of Bibliographical Notes giving where one may go for additional reading. Nowhere does Davis say this is where he got the alleged quote. Let’s look at those sources. Volume 37 of the SHSP is here. 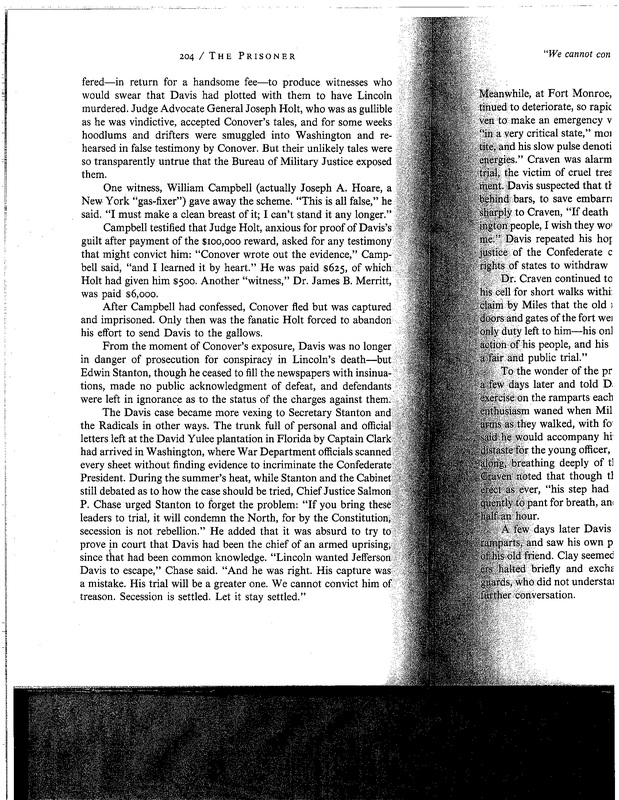 It includes the letter from George Shea, one of Davis’ lawyers, as Davis’ bibliographical note said and our incompetent friend wasn’t able to understand. It does not contain the alleged quote. Volume 38 of the SHSP is here. The article in question is unsigned. 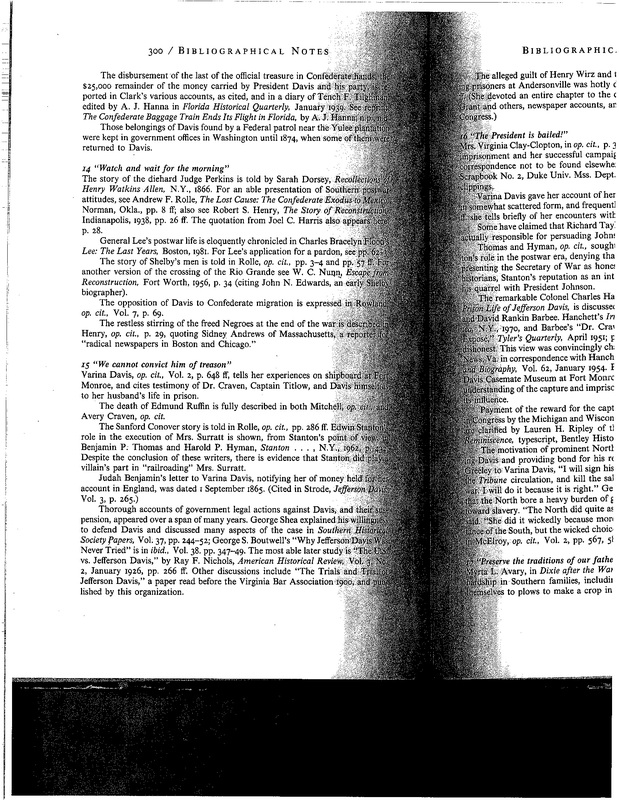 I couldn’t find anything in this volume that identifies the author of the article, which Davis and our erstwhile neoconfederate claims is written by George S. Boutwell, who was a Radical Republican Congressman from Massachusetts, Ulysses S. Grant’s Secretary of the Treasury, and later a Senator from Massachusetts. It also does not contain the alleged quote. I have the Roy [not Ray] F. Nichols article [note that our incompetent neoconfederate friend is so clueless he didn’t recognize the typo]. The alleged quote is not in it. “The Trials and Trial of Jefferson Davis,” by Charles M. Blackford, is here. Blackford was a Virginia lawyer and had been a confederate officer during the Civil War. The alleged quote is not in it. So much for Davis’ “sources” for the alleged quote. The quote is at odds with the record of Chase’s opinions on secession, such as his opinion in the Federal Case of Shortridge et al. v. Macon, 22 F. Cas. 20, 21 (C.C.D. N.C. 1867), Case No. 12,812, decided in June of 1867. In that decision, Chase firmly stated the acts of secession were unlawful acts, that those who fought for the confederacy were traitors to the United States, and that the war was a rebellion. Or his written opinion in the Supreme Court case of Texas v. White, 74 US 700, decided in April, 1869, in which he said secession was an unlawful act against the Constitution, and that the war was a rebellion. Thus the alleged quotation is completely at odds with what we can verify was Chase’s position regarding secession. In the absence of further evidence, we can’t take that quotation seriously. I really hope he replies to this. He keeps claiming he has not been proven wrong on his beliefs on several blogs when in reality he hasn’t proven anything he has said to be correct. Like you’ve pointed out, his sources leave something to be desired. He ignores James Madison, the ratification debates, the Congressional Globe, the secession documents, and when he does use a source he goes out of context. He completely rejected everything Chase said about secession. That’s how he works. He just ignores everything that proves him wrong. I am willing to state right here and now he will state that secession is not in the Constitution which means it is legal somewhere in this thread. By doing so he ignores that it is not legal because it is not in the Constitution. He can’t help himself. He manifests all the characteristics required to be a neoconfederate, most especially the first one. He’s too stupid to understand and too dishonest to admit anything. Great research to find and sift for the provable. Still it becomes a bit academic or lacking the reality that Jeff Davis was let go and not tried for treason nor made to take a loyalty oath, “a man without a country” I would contend the fraud that the “UNION IS DISSOLVED ” means the old U.S.A.et al is simply vacated and not lawfully occupied by a imposter government and congress that does not even meet when it is supposed to meet. The CSA is in a similar state vacated and unoccupied simply needing elected officials to take their place and replace the occupation constructive frauds simply declared by executive fiat or declared by the Secretary of State by “presidential proclamations that do not even have the president’s signature if you believe the occupation would have such a power. There was no recovery of or reconstruction of the original Union. Defacto simply means in fact, but is not the original or would be called Dejure. look up CSA definition in a BLACKs LAW (1979) for a clue on that. Chief Justice Chase, who presided over United States v. Jefferson Davis, ruled that the 14th Amendment had already punished Davis for the crime of treason, so trying him would constitute double jeopardy, something that was prohibited by the Constitution. As the CSA had no legal existence, it is not simply vacated and unoccupied. That rubbish is peddled by folks who haven’t read the applicable case law, and you shouldn’t allow yourself to be taken in by it. You also should look into Reconstruction. The original Union had slavery intact and African-Americans were not considered US citizens with the right to vote in all states. After Reconstruction we had the 13th, 14th, and 15th Amendments, so in that sense it was not the original Union. In all other ways, though, it was the original Union. As far as Black’s Law Dictionary goes, CSA in that is Credit Support Annex, which I don’t think is what you’re getting at.